Note: Headline for the post has changed. SIP data calculations for the Nifty were incorrect. We apologize for the error. September returns for the Nifty were at -1.3% taking the 2017 returns to 19.6% so far this year. This is the second consecutive negative month for the year. The Sensex has done slightly worse for the year. 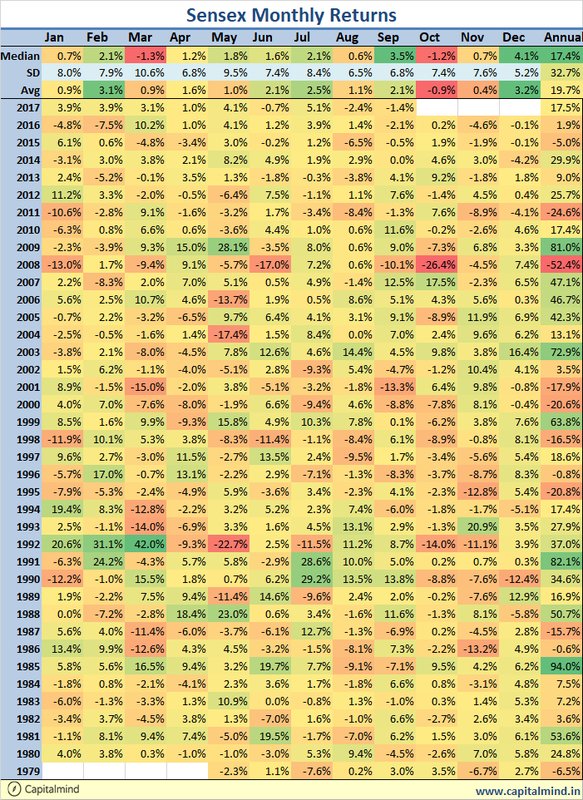 It’s still a little above median returns. Note: we had earlier posted that 10 year SIP return had fallen below 7%. It turns out that the 10 year return calculations had inadvertantly been calculated wrong for the SIP method. (point to point 10-year returns are below 7%, due to the rise in Nifty 10 years ago, but not SIP return) We apologise for the error. An error in an excel sheet we used has now been fixed, and now we have more accurate returns on what you would have made if you had invested on a regular basis (every month) for 10 years, your return would be 9.9% on the money so far. This may sound low but remember that the Nifty does not include dividends, so you would get about 1% to 2% more a year for dividends. The lowest was a 6% return around end-December. Overall, this is not too bad, and 5-year SIP is around 10.4% and a 3 year SIP, around 9.1%. 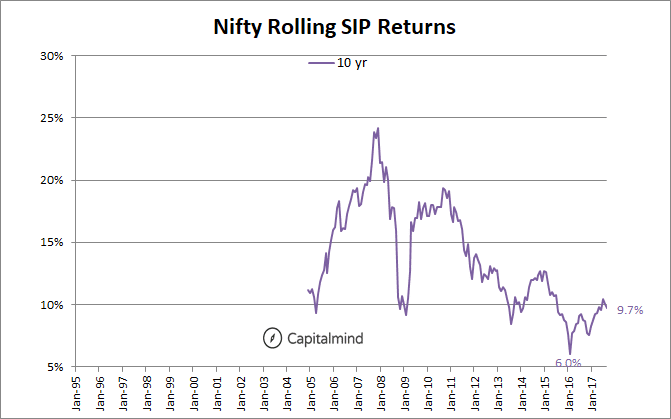 A lumpsum investment in 10 years would have only returned 6.9% so the SIP does seem to outperform. 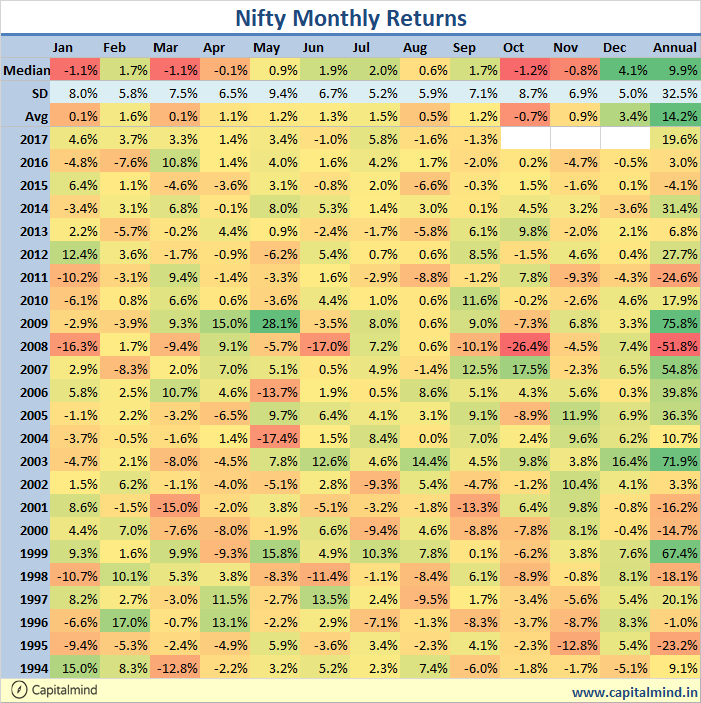 The Nifty 2017 returns at 19% till September is brilliant even with two bad months, back-to-back. October tends to be one of the worst months of the year (speaking of averages and medians) but with a very high standard deviation – so it’s a very volatile month. Let’s see what it has in store for us.